Creepy Cleveland: Offerings for the Dead? 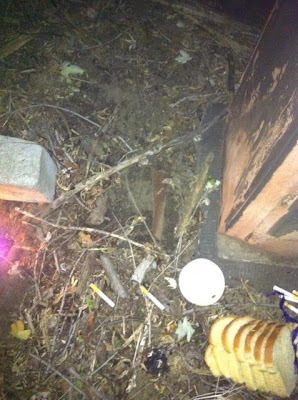 There are holes on either side of the tombstone in the second picture. Those holes are so flowers can be placed easily without having to dig in the ground and it makes it easier for the maintenance crew to mow the cemetery since the holders are flush with the ground. Most silk flower grave decorations have a spike-like device they are mounted in that fits into the holes. 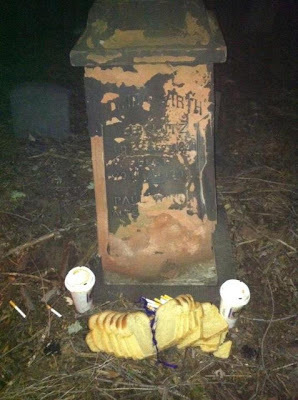 Leaving food for the deceased isn't too unusual, but those grave sites do look very old. It could be a distant relative paying their respects, but that black candle buring out in the open like that makes me suspicious. 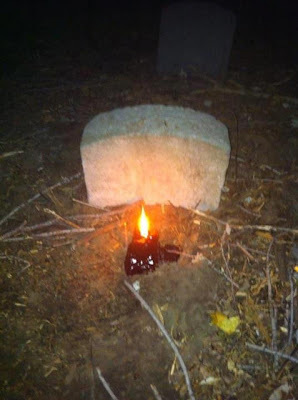 Most cemeteries won't allow candles of any sort anymore and those that do demand they are the glass encased vigil candles. This makes me think it might be a form of hoodoo. (not Voodoo not Wicca) Hoodoo is folk magic and there are a lot of spells, both for good and ill, that use actual graveyard dirt. But it is common practice to leave an offering before taking any dirt. Usually coins are left; but food, candles, and smokes wouldn't be unheard of either. I think it's just a black pillar candle in the 1st picture. For whatever reason, black candles are very messy when they burn. Lots of oozing molten wax. I have yet to find a brand of black candle that is dripless. BTW the braided string and black candle would make me think someone was casting a binding spell of some sort. It's unusual to see in this area, but this is voodoo. In this religion candle majick has always been practiced; colored candles stand for different wishes in one's life...for example, if one wanted to remove evil or send harm, they would burn a black candle...burning a while candle would be for protection. The 2nd and 3rd pictures look as if someone collected some graveyard dirt or in voodoo it's know as "goofer dust." Goofer dust is not evil per se, but how it's obtained and used can have consequences. I will not go into how the entire procedure is done due to many not being familiar with the practice and it's consequences. In these photos, what one has done is "bought" graveyard dirt aka goofer dust to use in a spell or curse and left gifts for wishes granted. There is a process to this and if not done correctly can have adverse effects on one. This has a lot of hallmarks of voodoo, and the loa Baron Samedi. In voodoo, the loa are spirits that have powers over certain matters. Baron Samedi is the loa of death and that's why this petition is being made in a grave yard. People make requests to the loa by giving them offerings. Because the loa have different personalities, certain loa favor certain gifts. Baron Samedi is partial to tobacco, black coffee, and bread, as well as rum. He's also associated with the colors black and purple, hence the black candle and purple hair. The hole probably probably dug by the petitioner and contains something that a person who the petitioner wants Baron Samedi to influence owned or touched. Wait, do you know who sent you the photos? !